Villages of Valeria is a 1-5 player, well thought-out, ‘city’ building card game that takes about an hour to play. Cost £25 for the base game and £4 for each (three) expansion. Designed by Rick Holzgrafe and Isaias Vallejo. Art by Mihajlo Dimitrievski. 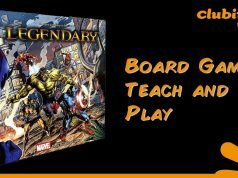 Published by Daily Magic Games. 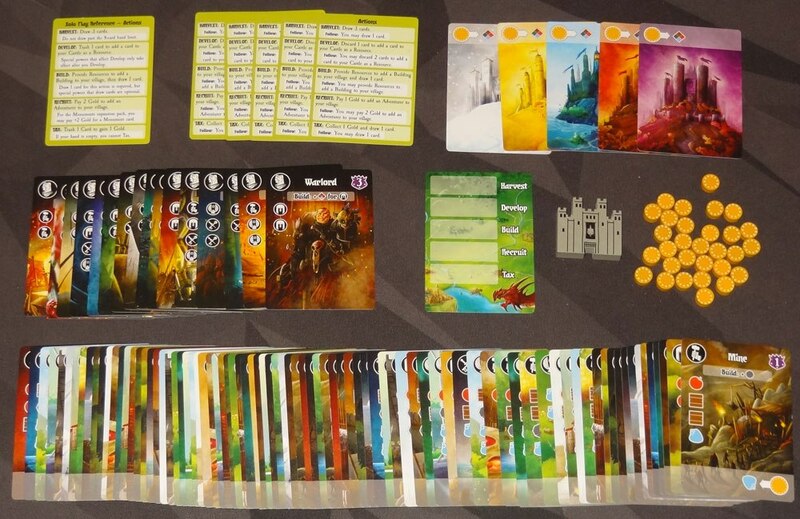 This is the second game to be based in the world of Valeria (the first being Valeria: Card Kingdoms). The two games are not compatible with each other but have the same artwork and iconography. In this game, the players are barons who are tasked by the king to create the best village to become the next capital city of the land of Valeria. You do this by gaining resources to construct various buildings in your village that then allow you to recruit various character to your village. Some of the buildings and characters are thematic e.g. the mine (once it has been built) provides you with one stone thereafter. When the total number of buildings and characters reach a predetermined amount, the end game is triggered. The buildings, characters and gold all generate victory points. The baron with the highest point total wins. Two rows of five face-up cards are placed on the table. A building and a character row. The corresponding deck is placed next to the row. Each player is given a castle, player aid and three gold coins. A supply of gold is kept at hand in a ‘bank’. To play the game players are dealt a hand of building cards and then takes turns at being the first or lead player. This player can take one of five actions. The other players, in turn, they can ‘follow’ (repeat the action to a lesser degree) or ‘pass’ (do nothing). E.g. the lead player performs the ‘tax’ action. They receive one gold and draw a building card. All the others players can ‘follow’ this action, but they only can draw a building card. Each player takes turns at being the first or lead player. As you construct your village various buildings will have either instant, constant or end game beneficial effects. Making these work together is what you need to do. You can use them to either to generate more resources, attract characters to your villages that have their own abilities or score extra victory points at the end of the game. Making your village work for you is where this games sing and will mean you will probably be victorious! Villages of Valeria is a neat and smooth flowing game that is easy enough to teach a non-gamer but has enough strategy to engage most seasoned ones. There is no set strategy to win and there are many paths to victory. The mechanisms are easy to learn and will be familiar to anyone who has played games like Puerto Rico or Imperial Settles. If in doubt there is a helpful player aid. As the lead player you need to choose an action that will help you, but minimise your opponents progress or none. When you are not the lead player, you still have to pay attention and watch what they are doing and decide whether you wish to ‘follow’ or ‘pass’. You are making decisions constantly. I have played Villages a number of times with differing groups of players and the general consensus has always been positive. 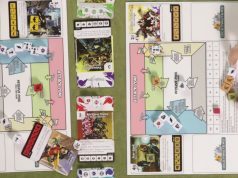 Three players are the sweet spot, but even up to five, the game does not feel drawn out or tedious. Having only five actions you can take means players are not overwhelmed with choices, but you are given just enough to make them think. In some rounds, certain choices are taken away from you too. I really like the artwork on both sides of the cards! Everything is drawn and coloured by the same artist in a cartoon-esque style that suits the game. It is bright and vibrant when it needs to be and dark and foreboding for the less savoury buildings or characters. The iconography is clean, clear and intuitive too. There are not that many in the game. The double-side player aid is helpful to explain what the actions are and on the other side, the icons are explained. There is not a lot of language on the cards so it would work well with people whose first language is not English. The quality of the components is high without being extravagant. The card stock is decent with a linen finish. The box is robust and small. The games have little wooden gold coins and a castle marker to denote which action the lead player took. The size of the game is another plus. The box is large enough to hold two card decks. This means the game is extremely portable. You can slip it into your bag with larger games with little problem. I think this I have played it so often. I am always carrying it around. Neither does it take up a lot of room on the table. You stack certain groupings of cards together so your village never sprawls all over the place. The rulebook is short and well laid out. I had no problems learning the game from scratch. The setup of the game and endgame trigger is a little different for each player count. There is also a helpful guide on the back page for this. I have not found myself consulting the rulebook to check minor details. Apart from choosing to ‘follow’ or ‘pass’, there are not many interactions between the villages. You cannot attack each other although you can help another player by choosing an action that would be beneficial to them. Conversely, choose one where following is not possible and thwart their progress. There is no ‘take that’ element to the game. You can grab certain buildings or characters before they do if they look to be pursuing a certain path, but that is about it. This is strong. There are so many different ways to build your engine depending on which cards come out, you are able to put into your hand and then play. You will want to try different ones each time you play. I have seen so many different paths to victory. The base game plus all the expansions will cost about £35. It was well worth buying especially when you consider the number plays it has had. It works well with three to five players. 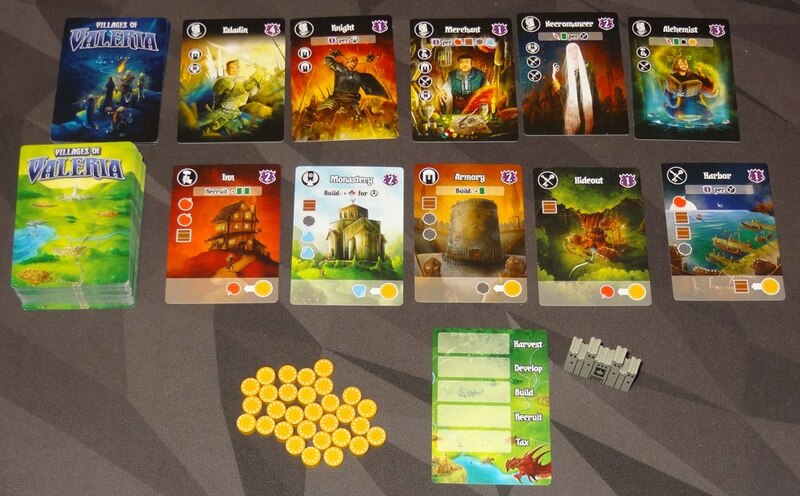 If you are looking for a game that works well with five players, this is one you need to buy. This is the weakest area where this game is concerned. As mentioned in the overview, there is a back story, but it not one you are invested in throughout the game. Once mentioned you just plough on creating your engine or tableaux of cards. The game has three expansion: Monuments, Guild Halls and Events. I would buy them in that order. With the exception of the first one, they do not change the game a great deal and the game plays fine without them. They all add more buildings and characters. Monuments add an extra special building that scores big victory points but require a lot of resources to build them and the latter two add events cards. Four random event cards can be shuffled into the building’s deck before the first action is taken. They may never appear in the game. Some event cards will help you and others scupper your plans if they pop-up at the wrong time. I always play with monuments and extra characters, but I may leave the events out. The expansions fit into the box. 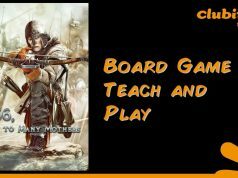 This game flies a little bit under the radar, but it has hit the table on so many occasions.The fact that it extremely versatile in its appeal is one of its biggest selling points. The others are the small box size and table presence, smooth gameplay and multiple paths to victory. For a keen gamer, storage space is always at a premium. This one will find a gap on your shelf. 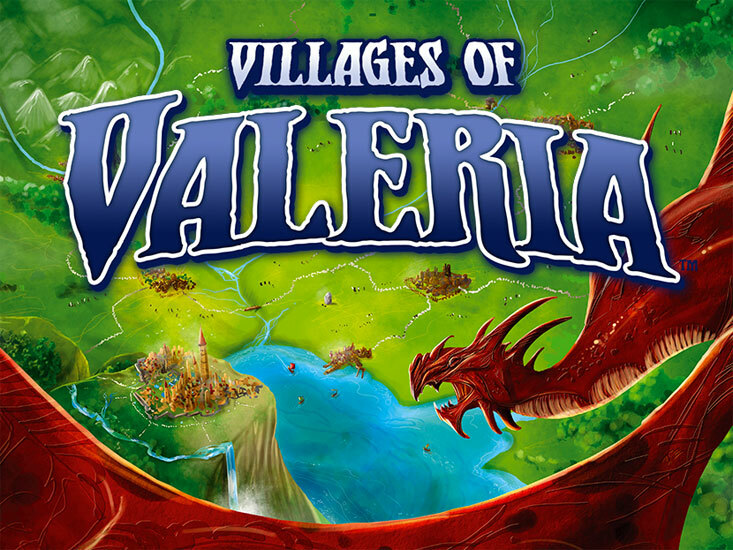 It is pretty much a just deck of cards and a few tokens but has provided me with hours of fun and I would gladly recommend Villages of Valeria! It is well worth a try.